It just never ends | The Old Adam Lives! If I ever do that, please flame me in a comment! I’m gonna hit the hay now, but tomorrow I plan on perusing your site, JS. If I ever hold out the law as a carrot, let me have it…but good! It’s such a hard balance isn’t it! I’m not saying it should be – the problem is with all good intentions sometimes you just put ‘you gotta do this’, maybe not even meaning it as law, but that is how it ends up. I think we all fall for that. You can see how many church traditions (especially say in the Rome church) came from someones good idea. Maybe it even came from someone having a good heart about something for themselves – for example, honoring the Lord by not eating red meat on a certain day. That may well have been one persons personal decision to honour the Lord – which is entirely their right, and may even have been entirely right for them. It is when that conviction from one person for a personal act is pushed to others as a ‘requirement’ to be ‘holy’, that suddenly what was grace turns into law. And that is just one example! How about going to church because we ‘have to’. What was grace and thanksgiving turns into personal law, and we gain nothing from it. Yes, Drewe,” good intentions” can be a real problem. It is so important to know that the law was given so that we might live together (better), and the theological use of a mirror (to show us our sinfulness…and thereby drive us to despair in our own goodness and drive us to Christ. oh no I know you visit my blog from time to time – I’m mentally scanning my last posts to see if I’ve done this. It’s so easy to do!!! This is the one that use to get me when I was “trying” within that atmosphere. Because just as a matter of natural ability I’m pretty disciplined as a person and can work long winded compared to most. I say that not as brag but a kind of Paul reflecting former Saul moment. There were tons of these types doing exactly what you just said, so I’d believe it then do it. But I’d always attempt to do it MORE. E.g. after a, ridiculous, “Christian” conference that was huffing and puffing about prayer and going “into one’s prayer closet for 30 minutes or an hour to ‘get into the presence of the holy of holies’” (explained with GREAT fervor and passion), I thought, “ALRIGHT!” So I tried 2 and 3 hours. When the pastor, who never did this himself by the way, would call on a dedication of doing some street door to door evangelism one day a week, add shoot for two or three. But at length what I began to notice in my “extra efforts” was the laziness compared to the “exhortation” of those I was following. It was a more truly “do what I say, not what I do”. I mean if one is GOING to be law driven anyway, one ought to do it well! That lazy effort on top of what seemed to be a strong “exhortation” just reeked of hypocrisy to me. It’s kind of what Luther said comparing the old Pelagians versus the semi-pelagians to Erasmus. He said that at least the Pelagians required more effort than the paltry foolishness of the semi-pelagians. Same thing. Other examples would be negative exhortations like, “you shouldn’t go to the track or play poker or something (now I don’t do these not for “pious reasons” its simply not something I enjoy – like soccer and lima beans). But then I had a close strong pietistic Christian friend tell me how they won a couple hundred dollars on their NCAA brackets. But as they said, “I wasn’t gambling, only doing it for fun.” Come on!!! Or its similar to our morbid fascination with having to slow down and look at a recent car wreck (joking of course). Thank you, Charile, Matt, Larry. Nice one, Josh! You caught me! There is that, but we Lutherans seem to live in such a world of keeping various truths in tension–law/gospel, sinner/saint etc. 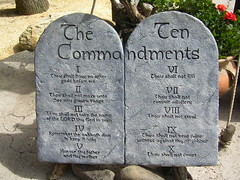 I’m thinking of of the wonderful freedom in Christ Luther taught and at the same time in his explanations of the Ten Commandments, there are even higher expectations for us. Just a thought. I know well that we are unable to do any of this in our own strength, but thought I’d throw in my 2 cents. No doubt we want to live the way that God created us to live (when we are at our best). But, we can’t. So then, what is the next scenario? That we live as best we can. What is the best way to get that result? It’s either the prodding of the law, or the freedom of the gospel. Or a combo. The law should be out (for us) because it is the ministry of death. it doesn’t make us better, but worse (as St. Paul tells us). The combo is just as bad really, because it waters down and actuallyn destroys the gospel. Makes it into another gospel. (also St. Paul). That leaves the gospel to free and inspire us to do whatever it is that God inspires us to do. That’s the centerist Lutheran view that I hold to, anyway. Hi Steve – you asked earlier on another blog about my mr green face. Its a wordpress emoticon. You hit spacebar, colon,mrgreen, colon, spacebar. For your future smilie fun! A few weeks after: Witness the outpouring of blog posts on “How a Christian shuold respond to the death of Osama bun Laden”……..